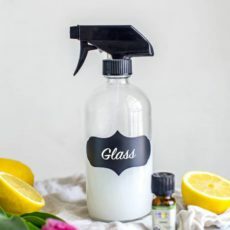 This homemade DIY natural glass and window cleaner with vinegar, alcohol, cornstarch and essential oils is ammonia-free, perfect for cleaning and washing windows and mirrors safely and effectively! We’re back with another DIY homemade cleaning recipe! 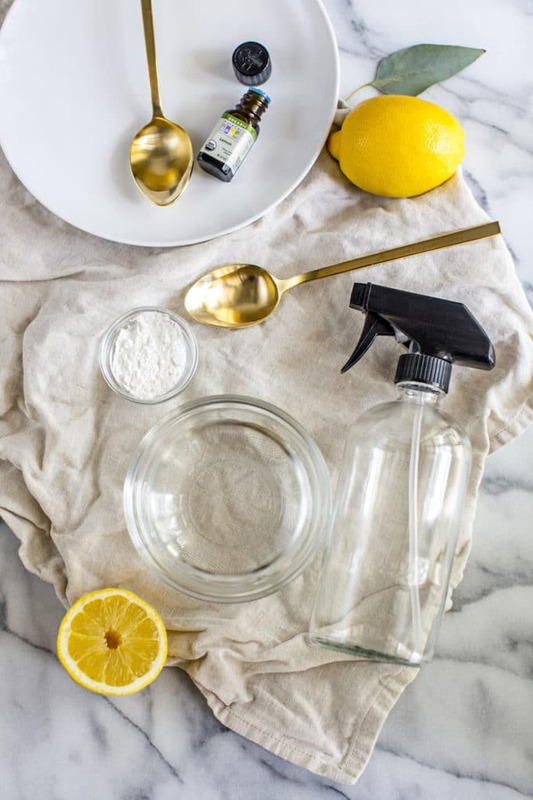 If you like saving money, ridding your home of toxic chemicals, and treating your body and the planet with kindness, you’re going to love this DIY natural glass and window cleaner recipe. P.S. Don’t forget, there’s still 3 days left to enter to win an Art Naturals essential oil diffuser + an 8-piece aromatherapy gift set (a $47 value)! Enter to win here. 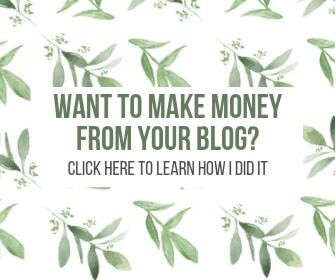 WHY MAKE YOUR OWN GLASS AND WINDOW CLEANER? Alright, I feel like a broken record by now, but just in case anyone is just coming to Root + Revel for the first time and they haven’t heard one of my speeches before let’s do a quick recap. –> they change their ways and one day, we can walk into any store and trust that we’re buying products that won’t harm us. Seriously, making your own cleaning products is SO MUCH safer and if that isn’t enough to convince you, consider that it’s also WAYYYYYYYYY cheaper. I mean, really. At less than a freaking dollar to make an entire bottle of glass and window cleaner, you really can’t afford not to make your own cleaning products, and that’s coming from me, the anti-crafter. I swear to you this recipe takes less than 2 minutes to make. Pour the above ingredients into a spray bottle, shake it up, you’re done. Popular brands like Invisible Glass make it near impossible to find out exactly what’s in their cleaner–to me, this is a red flag. Please never buy anything if the company won’t even tell you what’s in it. But for the most part, Windex dominates the glass cleaning aisle at most stores. This is bad on so many levels, as Windex is brimming with toxic chemicals. Sodium Borate: This asthmagen is really scary–not only does it have a high risk for damaging fertility or the unborn child with clear evidence of endocrine disruption, it also causes dermatitis, respiratory irritation and allergies. Note: those products containing the unspecified ingredient “Buffer” may contain sodium borate. Ammonium Hydroxide: This is that ammonia solution we all thought was so awesome for so long… as it turns out, ammonia not only harms sea life, it also causes respiratory damage and skin irritation, allergies and even vision problems. Ethanolamine: Windex isn’t the only glass cleaner using this chemical compound in their products. Glass Plus also adds this to their cleaner and what do you know, it’s an asthmagen that causes severe skin burns and eye damage, central nervous system depression, respiratory irritation and has chronic aquatic toxicity. Glycol Ethers: Both Windex and Clorox Glass Cleaner add this unspecific ingredient to their cleaner, which may contain Ethoxyethanol, a substance that disrupts our hormones (think reproductive toxicity, fertility damage, harm to unborn children and embryo/fetal damage) and has been proven to be dangerous to inhale or touch our skin. 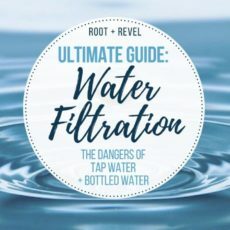 Other concerns (as if those weren’t enough) include general systemic/organ effects, cancer, damage to DNA, respiratory effects, nervous system effects, digestive system effects, skin irritation, allergies and damage to vision. 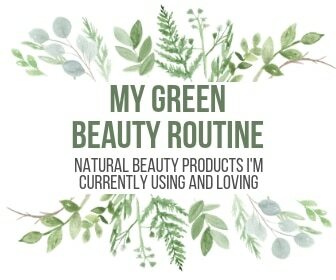 All of this before you even consider that almost all store-bought glass and window cleaners also contain fragrance (another hormone disrupter and asthmagen), artifical colors and dyes and sodium laureth sulfates (a skin irritant that’s toxic to sea life). Not exactly the kind of stuff you want filling your home, right? Fortunately, this recipe for homemade glass cleaner will have you washing windows and cleaning mirrors just as effectively (if not more!) without any of the negative side effects. 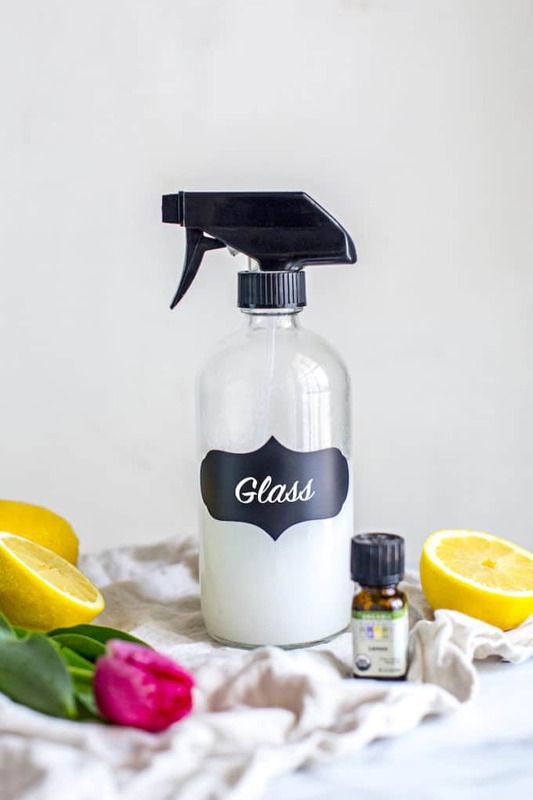 Rather than using ammonia and other toxic chemicals, this homemade glass cleaner is made with vinegar, rubbing alcohol and water. Plus a little cornstarch, which is the secret ingredient to steak-free windows and mirrors. It acts as a mild abrasive on the surfaces, scrubbing it gently to ensure squeaky clean windows and mirrors. Once again, I rely on essential oils, rather than synthetic fragrance, to scent this glass cleaner. 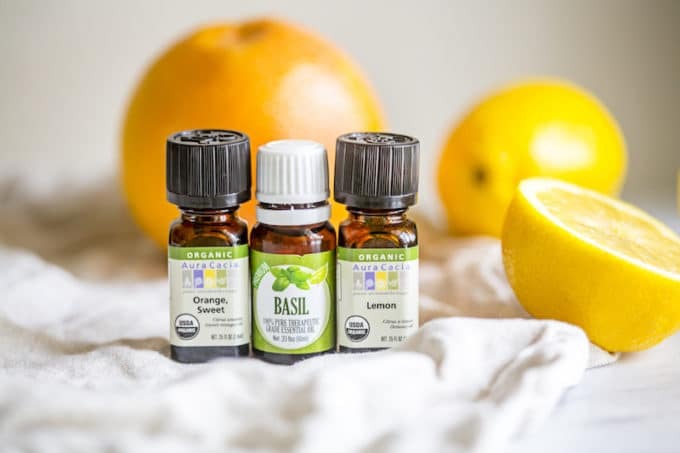 And once again, I recommend using crisp citrus oils like sweet orange, lemon or grapefruit or refreshing green oils, like bergamot, tea tree, eucalyptus and basil, which all smell super clean and even naturally have antibacterial, antifungal, antiseptic, and germicidal properties. I’ve also read that wiping your mirrors and windows with good ole’ fashioned black and white newspaper is a sure-fire way to get streak-free windows. I have no idea why or how this works, but if you’ve got old papers lying around (surely someone out there still reads the newspaper in print, right?! ), give it a try! If you’re looking for spray bottles, I recommend these glass spray bottles, which are the perfect size, pretty to look at and you don’t have to worry about BPA in the plastic. Happy Cleaning! Add the cornstarch to the warm water in a measuring cup fitted with a spout. Stir until cornstarch is dissolved. Add the remaining ingredients and stir to combine. Pour into a glass bottle fitted with a spray top. These are great recipes. I will be trying this weekend. Please make sure to note that there are NO ESSENTIAL OILS THAT ARE SAFE FOR PETS. Especially cats. They can do serious harm and since they are only for scent, they aren’t vital to the recipes. Thank you again for the great ideas! 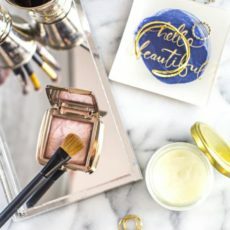 Hi, Kristin: The oils actually are not only there for scent. They have lots of antibacterial, antifungal, antiseptic, and germicidal properties. Also, your pets (especially cats) likely are not ingesting glass and window cleaner, so that’s not something I would worry about. 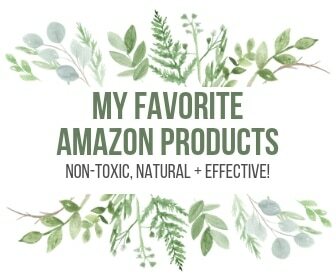 I have 2 cats and 1 dog and have never had any trouble using essential oils in cleaning products. I just don’t feed them to my pets 😉 Thanks for your input, though. Do the recipe call only for organic cornstarch or can i use a regular cobrstarch? You can definitely use regular – I just prefer organic since corn is a highly sprayed and often GMO crop. 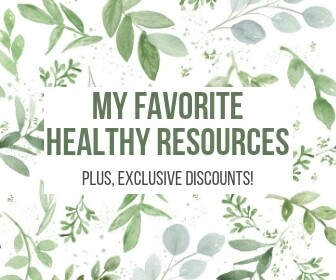 I love how essential oils can be used for just about anything! 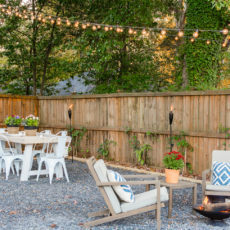 And you can’t beat the total cost! Can’t wait to try this! These are my favorite R + R recipes! Thank you! Can we get your permission to copy portion of this article for our patients? (with credits and link to actual article provided). This definitely makes me want to reconsider my window cleaner. I’m looking forward to trying out your solution. So I have a UV protection film on my windows, would it be better to leave the cornstarch out since it is an abrasive? Hi, Mark: I’m not familiar with that film, so you’re probably best to ask the company. They had said before to just stick with vinegar and water, so I’m guessing the corn starch can be left out of the recipe and it would still work.